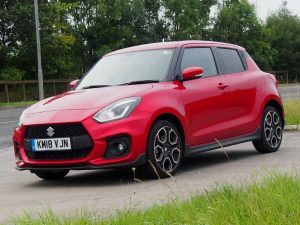 The Suzuki Swift is one of my favourite superminis. It’s not the most comfortable, and it’s not the most roomy. Nor is it the quickest or best handling in its class. However it is pretty damn good at everything. It has no bad traits or serious shortcomings. 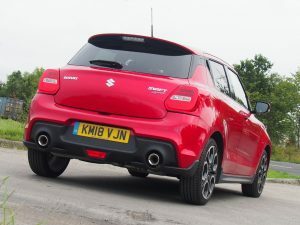 It’s a perfectly capable, vice-free wee car and that’s what makes it desirable and enjoyable. Take the whole package into account, and for the price it is better than most. However, it has to be said that the front seats do tend to favour the slim-fit or skinny jeans generation, but the trouble is, this car is too good to be left to the weans. This is an adrenaline injection on wheels for those catching their second wind, suffering a midlife crisis or just grumpy auld gits who want to convert wrinkles into smiles. So it’s not just for the teens and twenty-somethings on a budget and wanting some thrills. 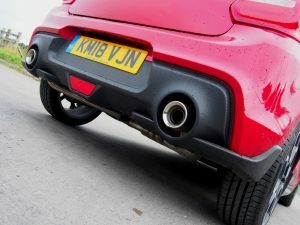 Anyone who derives joy from driving will enjoy the pin sharp handling, the flat cornering and the gentle tug of torque steer as you power out of corners. And there is power enough to do that as the previous 1.6 litre normally aspirated engine has been replaced by a new 1.4 litre unit with a turbocharger. With that you get 138 bhp in a car that weighs less than a tonne – before you start loading it up with fluids and folk. The 0 to 62 mph standing start time of 8.1 seconds doesn’t sound very impressive, but once it gets off its mark and the turbo starts blowing it picks up speed very quickly. That’s down to the 230 Nm of torque at 2500 rpm which is pretty impressive from a petrol engine of this size and just helps to keep the wee thing boiling along at a sometimes silly pace. And that’s where it scores, on the move. 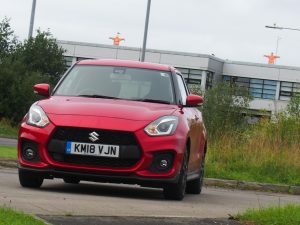 With the turbo spinning nicely mid range and a six speed gearbox to keep it tickled, this wee car is as much fun as a feather duster in nudist camp. It’s not the most luxuriously equipped car in its class but the standard spec includes a DAB radio and satellite navigation. It also has LED headlights and tail lights, adaptive cruise control, a reversing camera, keyless entry and a 4.2in display within the main instrument binnacle and between the rev counter and speedo that can show boost pressure along with horsepower and torque. You also get a reversing camera but in a car this compact it’s always easy to find a parking spot even if some overblown 4×4 is sagging over its white lined box in a car park. And it seats four adults, albeit, don’t plan on any family camping trips to the south of France. The boot space is OK for a couple of big shopping bags and tow holiday holdalls so it would suit the young family who just need a practical runabout, but one with a bit of zip for weekend fun. 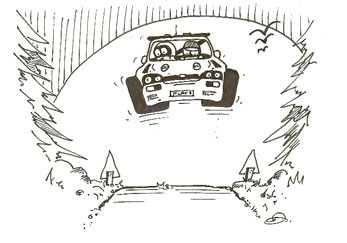 In fact, it would just about suit me down to the ground, apart from the bum-nipping seats. Fine for short journeys but not ideal for longer trips. Best to try it out for yourself if you fancy a bit of affordable fun in a compact package.